Know What is ELSS or Equity linked Savings scheme? Go through ELSS features, benefits and other important details on these popular tax saving mutual funds in India. Indeed a jumbo post to read! 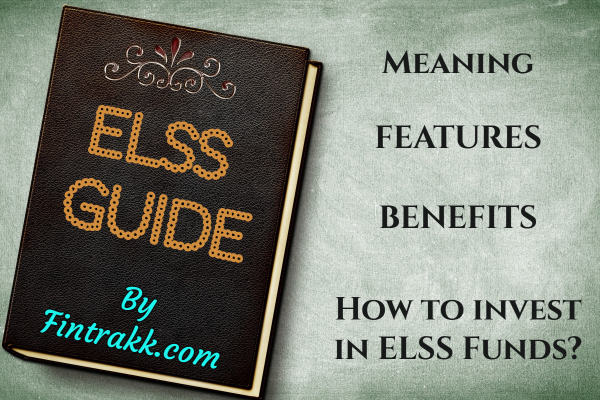 All your doubts shall get cleared after scrolling down this comprehensive guide on ELSS funds. Equity linked Savings scheme (ELSS) or tax saving mutual funds are diversified equity mutual fund schemes. Investments made in ELSS schemes are eligible for tax deduction under section 80C. ELSS schemes have been promoted by government to get more investors into equity markets. Simple hypothesis being with tax incentive, the available mutual funds will become attractive to more and more retail investors. Hence, the penetration of equity investments will increase in India. Mutual funds are investment funds which pool together funds from a group of investors and invest the same in equity markets, debt instruments or a combination of both. Funds which invest major part of their investments in equity are called equity mutual funds. Similarly funds investing majority of their assets in debt instruments are called debt funds. Mutual funds define your investment objectives. Mutual funds are run by Asset Management companies. There are more than 20 + AMCs active in India. Some of the top AMCs in India include SBI Mutual fund, ICICI Pru Mutual Fund, Franklin templeton mutual fund, HDFC mutual fund, Axis Mutual Fund,Birla Sun life mutual fund etc. All mutual funds in India are regulated by Security and exchange board of India (SEBI). AMFI ( Association of Mutual funds in India) is the nodal association of mutual funds in India. They provide information and resources regarding different mutual fund schemes in India. Equity mutual funds as with any other investment in equities is subject to market risks. You can invest online or offline in mutual funds. Mutual fund investments can be done in lumpsum or using Systematic Investment plan. Equity funds didn’t attract any long term capital gain tax earlier. W.e.f. 1st April 2018 a Long term Capital Gain tax has been imposed on equity funds including ELSS funds as well. Hence, LTCG (on equity + mutual fund investments) exceeding Rs.1 lakh shall be taxed @ 10%(plus cess). Only LTCG made after January 31, 2018 shall be taxed. Further, no indexation benefit to be allowed on these transactions. Tax Returns is an annual ritual which every Indian tax payer goes through in the beginning of the financial year . Before you file returns, you have to declare your investment proofs for different deductions available for tax saving as per The Income Tax Act. ELSS (equity linked saving scheme) Funds or tax saving mutual funds are special type of diversified mutual funds wherein investments made in these funds can be used for tax deductions under section 80C. Take out the income tax exemption in terms of structure, ELSS funds are similar to diversified equity mutual funds. Typically, they invest 80 % of their funds in equities which are spread across large cap, midcap and small cap stocks rest of the equity is invested in bonds or debt instruments. Most of the ELSS mutual funds have a stated objective to grow your wealth in long term and help you save taxes . Almost every top AMC offers an ELSS scheme most of these schemes are open ended. ELSS mutual fund schemes are available in following flavors. Dividend schemes: These are tax saving schemes which provide periodic dividend post the lock-in period of 3 years. Growth Schemes: These schemes keep on growing your money any gains you make are invested back and keeps on growing your NAV. All ELSS investments are subject to a 3 year lock in period which means you cannot withdraw your money before 3 years. While on the face value it might look like a limitation but for equity mutual fund this can be a blessing in disguise. Over long period of time equity markets tend to outperform every other asset so a lock in period can actually be good for your investments. As compared to other tax saving investments like PPF or long term fixed deposits which have lock-in of 15 and 5 years respectively they provide better flexibility and liquidity. Expert advise to stay invested for longer periods in ELSS schemes to get good growth. While you can invest as much as you want in ELSS funds but tax deductions are only available upto a maximum limit of Rs 1.5 lacs per year. The tax deduction under section 80C makes ELSS a compelling investments. Earlier, ELSS used to fall under the category of EEE (exempt-exempt-exempt) investment. In ELSS, you get upfront tax deduction and your principal investment is also not taxed. As per amendment in Budget 2018: The capital gains in excess of Rs.1 lakh shall be taxed @ 10% (plus cess). This has turned ELSS into EET (exempt-exempt-taxable) investment. You can start investing with as small a amount as Rs 500 and can invest as much as you like. Different ELSS funds can have different risk profiles based on their investment profile, you can check the fund risk parameters to assess the individual risk . In general, funds which invest larger portion of their investments in small and mid caps are more riskier than funds with more investments in large caps. ELSS funds is a good way to grow your money by utilizing service of best in line fund managers and research to manage your funds. All of this comes at a fraction of cost it will cost if you have to hire your own fund manager. You can start with a very small investment as small as Rs 500 per month. You can avail of Systematic Investment plans to structure your investments across the year . It reduces your average cost of investment and provides superior returns than one time lump sum investments. You get a wide choice of funds which you can invest in. So, you can pick up funds as per your requirements also detailed data on past performance is available for the funds which helps you choose the right funds . ELSS investments can be made online or offline. You can talk to your mutual fund advisor or distributor. ELSS mutual funds are open end scheme hence you can invest at any time of the year. You can invest at any time during the year as per your own convenience. As compared to other tax saving instruments available under section 80C, ELSS provides better liquidity because of the lower lock-in period of 3 years as compared to PPF which has 15 year lock in period. How much and how to invest in ELSS/ Tax saving mutual funds? While you can invest as much as you want in ELSS mutual funds tax exemptions are available only upto 1.5 lacs per annum. So, the next question is how should you realistically invest in mutual funds. ALSO READ Fixed Deposit,FD Interest,Tax on FD - A complete guide! Treat your tax saving investment as an exercise not to just save taxes but grow your money in a meaningful way. Tax saving money should be invested for long term goals. It seems prudent to invest some of your funds in equity instruments like ELSS. Look at your risk profile and see what kind of debt and equity resources you want to maintain. Investing in ELSS funds is similar to investing in any other mutual funds you can invest online or offline through a distributor. Before you start investing create your tax management goals which includes how much you want to invest and what is the financial goal you want to achieve with this investment apart from tax planning. Once you have your goals ready, the next step is to arrive at the total investment you want to make under tax saving mutual funds. Next step is to choose the best funds for your investment. You will need to fill the application form, provide a cancelled cheque and complete a KYC process, fill up FATCA declaration to start your investment. You have the option to start your ELSS investments through Systematic Investment plan and invest all through the year rather than one time investment at the end of the year. This helps to lower the average cost for your investments. How to choose an ELSS fund? Selecting an ELSS fund is similar to investing in other types of mutual funds. So, one needs to follow the same rigour before investing in an ELSS fund. Here are broad steps to follow before you invest in ELSS mutual funds. While the default investment objective is to save taxes but as explained earlier you should have a growth objective to all your ELSS investments. Investment objective should have a specific financial goal and time to goal etc. Next step is to define your expectations in terms of returns and the time horizon you are looking at this helps you choose the right portfolio and the best funds. You can do shortlisting using a good platform like valueresearchonline and select 4 star and 5 star rated funds. Prefer funds which have consistent performance over 5- 10 years. Prefer funds who have a lower expense ratio. Review the risk metrics of funds and prefer funds with lower beta and alpha values. Once you have chosen the funds it is important to review it once a year. Traditionally, PPF has been the default tax saving instrument for masses across many years. In fact, it is like a tradition which gets passed from parents to kids to open up a PPF account as soon as you start working, you start making savings in PPF accounts on a regular basis. Premature withdrawal Not Allowed (3 years is the lock-in period) Partial Withdrawal allowed after 6 years subject to few conditions. ELSS investments are more likely to provide higher return if you are ready to be patient and invest for the long term. In last few years top ELSS funds have given 11-13 % returns on investment as compared to PPF which has seen returns in the range of 8-8.75 %. Below graph shows how your corpus will look like if you chose to invest all your 1.5 lac investment in PPF versus if you invest in top performing ELSS funds. * ELSS funds returns are assumed at 12%. If you see at the end for 15 years ELSS investments will get you to a corpus of 63 lacs versus approximately 40 lacs in PPF . ELSS or tax saving mutual funds also provide higher liquidity than PPF investments. Liquidity is one of the most under appreciated variable in financial planning . With a lower lockin period of 3 years ELSS provides superior liquidity than PPF. Higher liquidity ensure you have funds available when you need them. ELSS funds provide superior returns which makes them a much better investment than long term fixed deposits. Is there a way to withdraw funds from ELSS investments before 3 years? No, you cannot withdraw funds from ELSS funds before 3 years. Do higher NAV means the fund I am investing is better? Absolute NAV has no relation to the performance of funds. How can I pay for ELSS investments? You can pay with the help of debit card, through cheque, NEFT/RTGS etc. you cannot pay with credit card. What is the minimum SIP I can start investing for my ELSS investments? You can start with a SIP as small as Rs 500 for your ELSS investments. Is it better to invest using SIP or lumpsum investments are better? In general, you should invest using a SIP investments as it lowers your average cost. However, it’s truly based on your financial objectives and the excess funds you have to invest. How do I track my investments? If you are investing through an online mutual fund platform, you can track it on your dashboard. Otherwise, all mutual funds publish daily NAV which you can track on mutual fund site. Are their any entry loads on tax saving mutual fund investments? No, there are no entry loads on tax saving mutual funds. Can NRIs and PIOs invest in Tax saving mutual funds ? Yes, NRIs and PIOs can invest in tax saving mutual funds. Disclaimer: This post is not a financial advice in any regard. Please consult your financial adviser before taking any investment decision. Fintrakk.com or any of its representatives are not responsible for any loss that might happen due to your investments. Kindly follow due diligence and be cautious while investing your money in risky asset classes. This was all about ELSS funds, the popular tax saving mutual funds. Indeed a comprehensive guide for investors! Isn’t it? What’s your view on investing in ELSS? Do you consider it as a good long term investment option? Feel free to share your valuable opinions on the same. « What Makes Loans for Start Ups an Excellent Option?